Hopefully now I’ve updated you on the vital statistics of my journey I could tell you in a bit more detail about my day. 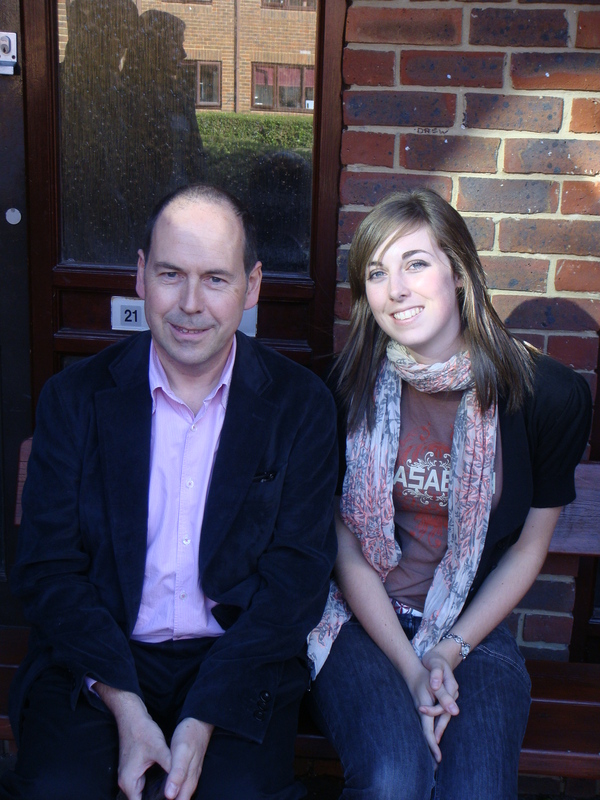 Luckily since meeting Rory Cellan-Jones and Peter Page, it would seem I had made a good enough first impression for another encounter. Sadly Peter was out on a job during the visit… but a few other faces appeared during the visit which kept me and Miss Caroline Scott amused.Since the Unplugged experiment in October last year I had planned to go up the studios in an acceptable form of stalking the BBC crew back to their base. I hadn’t really thought about what it was I wanted to do exactly when I got there, as work experience is off the cards (Damn you official BBC work experience page). I’d done the public tour before, but as expected you were following official routes designated for the general public which although fun for the first time – wasn’t anything exclusive I could write home about. I should perhaps interject that I asked Caroline to join me after she too had worked with Rory and Peter during the filming so rather than be entirely selfish and keep this treat for my own glory she sensibly came along too. One thing, which is probably not at all surprising but did lead me to the conclusion that any kind of great escape during the public visit to wander around the beeb and bump into any familiar journalistic face would not have worked. We had to be personally assisted through security. Even within the building the amount of time key fob swiping that happened at all but every door confirmed by Rory that you would almost certainly get stuck in a random corridor in the middle of the centre – not a glamorous collision with Fiona Bruce. We began the visit to Rory’s department, business & technology, and sat in on the morning meeting. I say sat, the meeting was a gathering on one side of the room all standing and putting forward what everyone had busy doing. I’ll be honest in that I was envisioning a meeting room with a lot more of a formal aspect – seeing as previous local newspaper work experience had entailed. From here, we were led around the office meeting people from 5live, the online crew, then visited BBC World Service, saw News 24 being recorded live, and ending up watching the 1 O’Clock news go out whilst sitting in the Gallery. This was a particular highlight as it was interesting watching the ridiculous amount of screens ranging from VT’s ready to air, live correspondents in Libya, Wales and the Isles of Scilly, and rival broadcasters. The last-minute changes and even removal of stories even during the broadcast and problems with sound could without doubt become an extremely stressful but exciting environment, 1 O’Clock being notoriously most difficult bulletin to work on. From here, I think Caroline’s favourite part for sure; we took a detour from News spur to the entertainment side of the centre. The BBC studios are often hired out to other production companies so along seeing (**SPOILER ALERT! **) Two Pints Of Larger and A Packet Of Crisps being filmed, we saw a run through of Celebrity Juice, the set for Channel Four’s Ten O’Clock Live, and the massive main studio used for shows such as Strictly Come Dancing. Finally, we grabbed a bite to eat at The Club which Rory kindly paid for (thank you again if you do get a chance to read this), and then a dash back to Victoria. 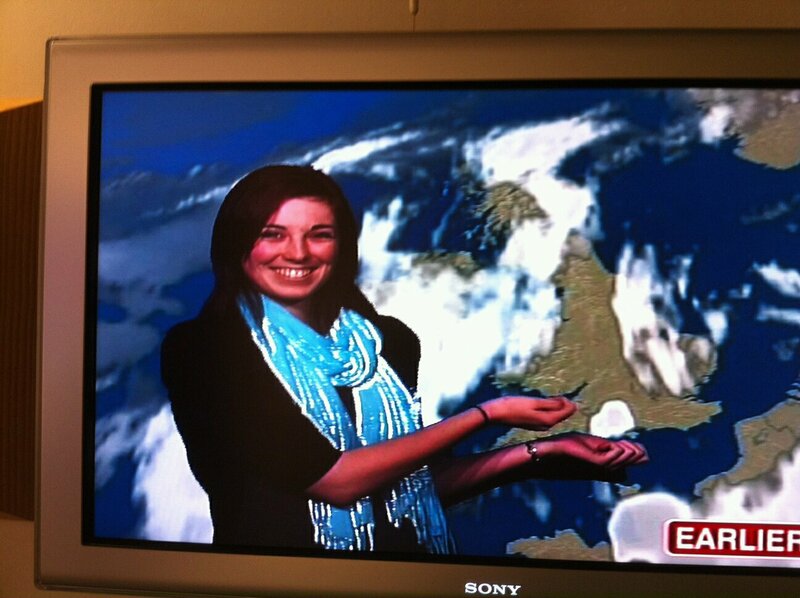 We then had a little play with the Weather’s green screen, including Rory! As you can see from the pictures, we aimed to be as professional as possible.Funnily enough whilst looking lost and panicked after exiting Victoria underground at a different exit to the nearer coach station one, I forgot I still had the BBC visitor tag pinned to my top. So in a rushed state I had a Big Issue calling ‘Hey BBC Lady, wanna buy a Big Issue?’ bringing even more attention to the fact that I didn’t really know where I was going. A day very much enjoyed! Saw a few famous faces like Kate Silverton and Gabby Logan. I would have loved to have been able to have popped into ZDF like I had planned – but time escaped and I think it’s a perfectly good excuse for another visit.